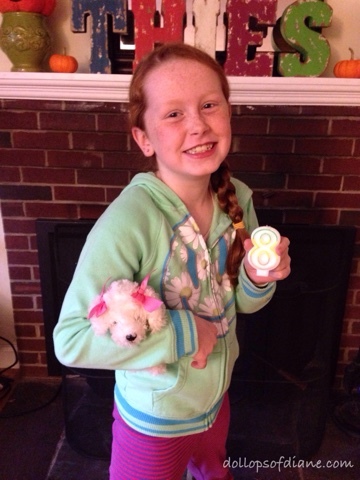 Dollops of Diane: Happy 8th Birthday, Isabelle!! Today's the big day that Isabelle turns the big EIGHT!! WOW!!! She had a great pizza, pajama party with her friends here at the house on Friday night. They made "friendship jars," played outside, played party games, and enjoyed pizza, cake, and ice cream while staying up "late" (8pm!). Such a fun night! If I had lots of money I would buy: A jumbo house with a swimming pool! We loved checking out her answers from years past this morning and seeing how she's changed (and stayed the same!). You can find her answers from last year HERE and from when she turned six HERE.